Munich (German: München German pronunciation: [ˈmʏnçən] Austro-Bavarian: Minga), the capital city of Bavaria, Germany, is the third largest city in the country, with approximately 1.35 million inhabitants of the city proper, and 2.3 million in its metropolitan area. Founded as a Benedictine monastery in the eighth century, it has a rich culture and has long been a center for fine architecture, the arts in general and music specifically. It is well-known for its annual beer festival, Oktoberfest, and its numerous breweries. Munich is an international location for science. Its scholastic institutions and research facilities have produced a long list of Nobel Prize laureates including Wilhelm Conrad Röntgen in 1901 to Theodor Hänsch in 2005. After World War I, Munich became a hotbed of right-wing politics, similar to which Adolf Hitler and the National Socialism emerged from. The former Dachau concentration camp is found 16 kilometers (9.9 mi) outside the city. The city has had to recover from devastation brought on by world wars, and with the international fallout from the kidnapping and murder of eleven Israeli athletes during the 1972 Olympics by the Palestinian militant group Black September. 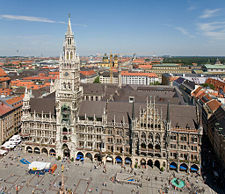 Today, Munich is the economic center of southern Germany, and has the strongest economy of any German city. It ranks consistently among the top 10 cities in the world for quality of life and has a low crime rate. Marienplatz and the new city hall. The name München is derived from the Old German word mönche, which means "monks" in English. 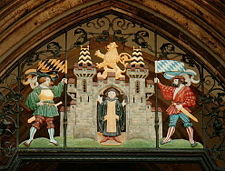 Munich was "the home of the monks,” which is why a monk appears on the city's coat of arms. Munich lies on the elevated plains of Upper Bavaria, about 31 miles (50 km) north of the Alps, in the Northern Alpine Foreland, at an altitude of about 1,700 feet (520 meters). The northern part of this sandy plateau includes a highly fertile flint area, while the southern part is covered by morainic hills. Around Munich there are fields of fluvio-glacial out-wash. Wherever these deposits get thinner, the ground water can flood the area, leading to marshes, as in the north of Munich. The local rivers are the Isar and the Würm. Munich has a continental climate, strongly modified by nearness to the Alps. Winters last from December to March, with January the coldest month, having an average temperature of 30°F (-2°C) and snow for several weeks. Summers, from May to September, are fairly warm with an average temperature of 70°F (19°C) in July. The range of temperature between day and night can be extreme. A warm downwind from the Alps (a föhn wind) can change the temperatures within a few hours, even in the winter, and the Alpenstau, in spring and summer, brings unseasonably low temperatures, rain, and even snow. The city's altitude and proximity to the Alps mean that precipitation is high. Mean annual precipitation is 32 inches (810 mm). Environmental pollution is comparatively low, although as of 2006 the city council was concerned about levels of particulate matter (PM), especially along the city's major thoroughfares. Environmental groups such as Greenpeace have staged large protest rallies to urge the city council and the State government to take a harder stance on pollution. Munich covers 120 square miles (310 square kilometers). At the center of the city is the Marienplatz—a large open square named after the Mariensäule, a Marian column in its center. This is located in Altstadt (old town), the medieval old town covering about one square kilometer, but which has enough shops, theaters, museums, historical sites, churches and beer gardens to attract 300,000 visitors a day. A pedestrian thoroughfare links the gates of the demolished medieval fortification—Karlstor on the west and Isartor on the east. Bogenhausen, comprising the city's northeastern quarter, is one of the city's prettiest neighborhoods and home to a number of late-nineteenth century buildings. The district skyline is dominated by the unique 374-foot (114 meter) Hypo Hochhaus skyscraper. Haidhausen, to the east of Altstadt, once a refuge for vagrants, prostitutes and the mentally ill has become a multicultural yuppie district boasting a lively pub and restaurant area. The area is filled with crêperies and delicatessens along stone-cobbled alleyways. Maxvorstadt, which was was Munich's first planned city expansion in the early nineteenth century, has museums, galleries and student pubs. Schwabing, which is a few minutes from Marienplatz by U-Bahn, is the old artists' quarter which is home to the Ludwig Maximilian University. The area has numerous bookstores, record and antique shops, boutiques and pubs. Schwabing's main street, Leopoldstraße, has scores of cafés with outdoor seating, boutiques, bars, and nightclubs. Munich city coat of arms. 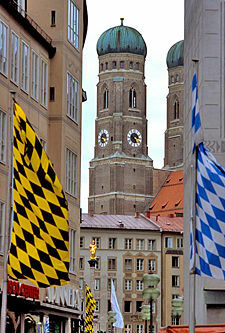 Banners with the colors of Bavaria (right) and Munich (left) with the Frauenkirche in the background. Tegernsee Abbey, founded in 746 by Benedictine monks 31 miles (50 km) south of Munich, had a substantial influence on development of Southern Bavaria. By 1158, the Guelph Henry the Lion, Duke of Saxony and Bavaria, had built a toll bridge over the river Isar next to the abbey, on the Salt Route. This is the earliest date the name “Munich” appeared in a document. In 1175, Munich was granted city status and was fortified. In 1180, Otto I Wittelsbach became Duke of Bavaria, and Munich was handed over to the Bishop of Freising. (Otto's heirs, the Wittelsbach dynasty, would rule Bavaria until 1918.) In 1240, Munich was transferred to Otto II Wittelsbach, and in 1255, when the Duchy of Bavaria was split in two, Munich became the ducal residence of Upper Bavaria. Duke Louis IV, who was elected German king, in 1314, and crowned as Holy Roman Emperor in 1328, granted Munich the salt monopoly, thus assuring it of additional income. In the late fifteenth century, the Old Town Hall was enlarged, and a new cathedral, the Frauenkirche, was constructed in a 20 year period beginning in 1468. Munich became capital when Bavaria was reunited in 1506. 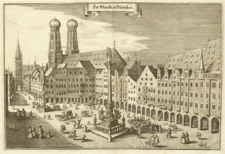 Duke Wilhelm V commissioned the Jesuit Michaelskirche, which became a center for the Counter-Reformation, and also built the Hofbräuhaus, for brewing brown beer in 1589. The Catholic League was founded in Munich in 1609. In 1623, during the Thirty Years' War (1618-1648), Munich prospered when Maximilian I, Duke of Bavaria became elector, but in 1632, the city was occupied by Gustav II Adolph of Sweden. The bubonic plague killed about one third of the population in outbreaks in 1634 and 1635. Under the regency of the Bavarian electors Munich was a center of baroque life, but also suffered under Habsburg occupations in 1704 and 1742. In 1806, the city became the capital of the new Kingdom of Bavaria, with the state's parliament (the Landtag) and the new archdiocese of Munich and Freising located in the city. Twenty years later Landshut University was moved to Munich. Many of the city's finest buildings were built under the first three Bavarian kings. Louis I, who was king from 1825 to 1848, created the city’s characteristic appearance. Louis II promoted the composer Richard Wagner, and revived Munich’s fame as a city of music. The Allied blockade of Germany during World War I (1914-1918) led to food and fuel shortages. Three bombs fell on Munich during French air raids in 1916. After World War I, the city was at the center of much political unrest. In November 1918, Ludwig III and his family fled as revolution loomed. The first republican premier of Bavaria, Kurt Eisner, was murdered in February 1919, by Anton Graf von Arco-Valley, and the Bavarian Soviet Republic was proclaimed, but was put down on May 3, 1919, by the Freikorps. Under republican government, Munich became a hotbed of right-wing politics, from which Adolf Hitler (1889-1945) and the National Socialism emerged. In 1923, Hitler and his supporters, who were concentrated in Munich, staged the Beer Hall Putsch, an attempt to overthrow the Weimar Republic and seize power. The revolt failed, resulting in Hitler's arrest and the temporary crippling of the Nazi Party, which was virtually unknown outside Munich. The National Socialists took power in Germany in 1933, and Munich was referred to as the "Capital of the Movement." The NSDAP headquarters were in Munich and many "Führer-buildings" were built around the Königsplatz, some of which have survived. The National Socialist Workers Party created the first concentration camp at Dachau, 10 miles (16 km) northwest of the city. It was in Munich that British Prime Minister Neville Chamberlain (1869-1940) assented to the annexation of Czechoslovakia's Sudetenland region into Greater Germany in the hopes of sating the desires of Hitler's Third Reich—a policy known as appeasement. Munich was the base of the White Rose, a group of students that formed a resistance movement from June 1942 to February 1943. The core members were arrested and executed following a distribution of leaflets in Munich University by Hans and Sophie Scholl. A total of 71 Allied air raids over six years heavily damaged Munich during World War II (1939-1945). 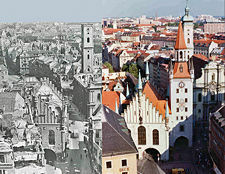 After American occupation in 1945, Munich was rebuilt following a meticulous plan which preserved its pre-war street grid. In 1957, Munich's population passed the 1 million mark. Munich was the site of the 1972 Summer Olympics, when gunmen from the Palestinian "Black September" group took hostage members of the Israeli Olympic team, killing eleven of them, in an event that became known as the "Munich Massacre." 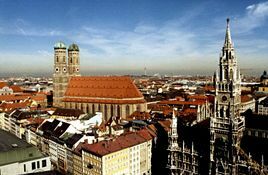 Munich is the third largest city in Germany after Berlin, and Hamburg. Munich is the capital of the Free State of Bavaria, which is one of Germany's 16 states (Länders). It is the seat of the Bavarian State Parliament, the Staatskanzlei (the State Chancellery) and of all state departments. Before January 1, 2000, Bavaria had a bicameral parliament, but the senate was abolished following a referendum in 1998. Since the administrative reform in 1992, Munich has been divided into 25 boroughs or Stadtbezirke. Munich's elected council is headed by a mayor. The state government controls welfare, planning, transportation, cultural affairs, among other government services. Several national and international authorities are located in Munich, including the German Tax Court and the European Patent Office. 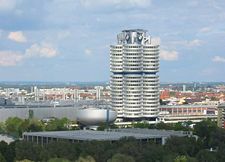 BMW Headquarters building (one of the few buildings that have been built from the top to the bottom) and the bowl shaped BMW museum. Munich is the economic center of southern Germany. The service sector accounts for 77 percent of Munich's GDP, while the manufacturing industry contributes just under 23 percent. Around 20 percent of Bavaria's population lives in Munich which generates nearly 30 percent of Bavaria's gross domestic product (GDP). In 2006, this figure totaled US$100-billion for Munich itself and US$177-billion for the region as a whole. Munich is a significant financial center, being home of HypoVereinsbank and the Bayerische Landesbank. It outranks Frankfurt, though, as home of insurance companies like Allianz and Munich Re, and has the headquarters of Siemens AG (electronics), BMW (car), MAN AG (truck manufacturer, engineering), Linde (gases), among others, as well as the German or European headquarters of Precision Plus, McDonald’s, and Microsoft. Munich has the strongest economy of any German city, as well as the lowest unemployment rate (5.6 percent) of any German city with more than a million people (the others being Berlin and Hamburg). Germany's unemployment was about 8 percent near the end of 2007. Munich is the largest publishing city in Europe and home to the Süddeutsche Zeitung, one of Germany's largest daily newspapers. Munich is also home to Germany's largest public broadcasting network, ARD, and its largest commercial network, Pro7-Sat1 Media AG, and is host to the Burda publishing group. The Bavaria Film Studios, located in the suburb of Grünwald, is one of Europe's largest film production studios. Mercer HR Consulting consistently rates the city among the top 10 cities with highest quality of life worldwide—a 2007 survey ranked Munich as 8th. The same company also ranks Munich as the world's 39th most expensive city to live in and the most expensive major city in Germany. High speed trains connect Munich to the main cities of Germany and Austria. Munich is an integral part of the motorway network of southern Germany. Motorways from Stuttgart, Berlin, Frankfurt, Lindau, Garmisch Partenkirchen, and Salzburg terminate at Munich. 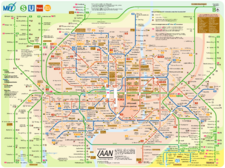 The city and its closest suburbs have one of the most comprehensive public transport systems in the world, incorporating the Munich U-Bahn (underground railway), the Munich S-Bahn (suburban trains), trams and buses. Bicycle lanes are widely used, and a modern bike hire system is available in the central area. Franz Josef Strauss International Airport is Germany's second largest airport, with about 34 million passengers a year, and lies some 30 km (19 mi) north east of the city center. 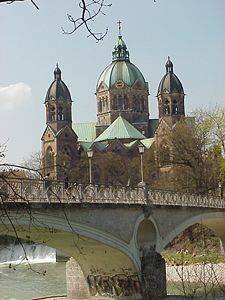 St. Lukas Church and River Isar. With 1.34 million inhabitants in July 2007, Munich was the third-largest city in Germany after Berlin and Hamburg. Several smaller traditional Bavarian towns and cities like Dachau, Freising, Erding, Starnberg, Landshut and Moosburg are part of the Greater Munich Region, making up the metropolitan area of about 4.5 million people. At 23 percent, the immigrant population is higher in Munich than the national average. The largest groups of foreign nationals were Turks (43,309), Albanians (30,385), Croats (24,866), Serbs (24,439), Greeks (22,486), Austrians (21,411), and Italians (20,847). About 37 percent of foreign nationals come from the European Union. 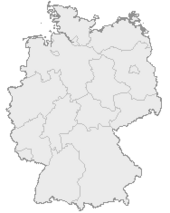 German is Germany's only official and most-widely spoken language. English is the most common foreign language and almost universally taught at the secondary school level. Christianity is the largest religion in Germany, followed by Islam. About 39.5 percent of Munich's inhabitants, in 2005, were Roman Catholic and 14.2 percentProtestant. 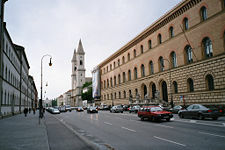 Munich has long been a leading location for science and research with a long list of Nobel Prize laureates from Wilhelm Conrad Röntgen, in 1901, to Theodor Hänsch in 2005. Both of Munich's main universities, the Ludwig Maximilian University, founded in 1472, and the Technical University, founded in 1868, were classified as elite universities, to qualify for millions of euros in funding. 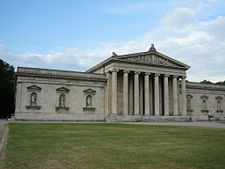 Other tertiary institutes include the Munich Business School, the Munich University of Applied Sciences, the Munich Intellectual Property Law Center, the University of the German Federal Armed Forces, the Hochschule für Musik und Theater München, and the Academy of Fine Arts, among others. The Max Planck Society, an independent German non-profit research organization, has its administrative headquarters in Munich, and a number of its research centers, including those for astrophysics, biochemistry, extraterrestrial physics, foreign and international social law, among others, are found there. Although Munich has long been a center for fine architecture, the arts, and especially music, the city is known in popular culture for Oktoberfest, held annually since October 12, 1810, initially to honor the marriage of crown prince Ludwig. 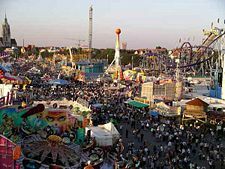 For two weeks each September, the Oktoberfest attracts millions of people visiting its beer tents ("Bierzelte") and fairground attractions. 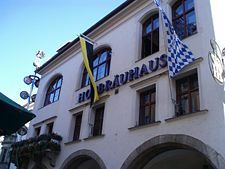 The famous Hofbräuhaus am Platzl beer hall is located in the city center, and Munich is famous for its breweries. The Englischer Garten, close to the city center and covering an area of 1.42 square miles (3.7 square kilometers), which is larger than Central Park in New York City, is one of the world's largest urban public parks, and contains a nudist area, jogging tracks, and bridle-paths. The German Museum, located on an island in the River Isar, is one of the oldest and largest science museums in the world, and has a flight exhibition center nearby. The State Museum of Ethnology is the second largest collection in Germany of artifacts from outside Europe, while the Bavarian National Museum and the adjoining Bavarian State Archaeological Collection rank among Europe's major art and cultural history museums. Heilig Kreuz in Fröttmaning, the oldest church in the city, which is known for its Romanesque fresco. The Peterskirche close to Marienplatz, which was the focus of the early monastic settlement before the city was founded in 1158. Nearby, the Gothic hall-church Heiliggeistkirche (The Church of the Holy Spirit) was converted to baroque style from 1724. The Frauenkirche, which is the most famous building in the city center, serves as cathedral for the Roman Catholic Archdiocese of Munich. The nearby Michaelskirche is the largest renaissance church north of the Alps. The Theatinerkirche is a basilica in Italianate high baroque. The large Residenz palace complex (begun in 1385) on the edge of Munich's Old Town, contains the treasury and the splendid rococo Cuvilliés Theatre. Next door is the neo-classical opera, the National Theatre. Baroque and neoclassical mansions include the Palais Porcia, the Palais Preysing, the Palais Holnstein, and the Prinz-Carl-Palais. The baroque Nymphenburg Palace is surrounded by an impressive park. Two kilometers northwest is Blutenburg Castle, an old ducal country seat with a late-Gothic palace church. Fürstenried Palace is a baroque palace similar to Nymphenburg but smaller, and Schleissheim Palace, located in the suburb of Oberschleissheim, is a palace complex encompassing three separate residences. Munich is home to several professional football teams, including 1860 Munich and FC Bayern Munich. The Munich area has three teams in the Bundesliga system, which comprises the three top divisions of German football. The city's hockey club is EHC Munich. Munich has long been a center for fine architecture, the arts, and for music. But it was also a Nazi stronghold, the notorious Dachau concentration camp was located nearby, and the city sustained extensive damage during World War II. The city was meticulously rebuilt preserving its pre-war plan, and has gone on to become the third largest city in Germany, and ranked among the top 10 cities worldwide for quality of life, especially for its low crime rate. The annual Oktoberfest makes the city a regular stopping point for travelers from around the world. Its status as a leading location for science and research, as well as the location of the headquarters of some of the world’s top companies should ensure ongoing prosperity. ↑ Bayerisches Landesamt für Statistik und Datenverarbeitung. www.statistik.bayern.de (in German). Retrieved May 17, 2008. ↑ Messe München GmbH, City ranking: Munich is the most attractive business location in Germany. Retrieved September 20, 2008. ↑ Bundesagentur für Arbeit, Federal agency statistics. Retrieved September 20, 2008. ↑ Munich Department of Arts and Culture, Munich Literature House: About Us. Retrieved September 20, 2008. ↑ German Impressum, In Hesse the purchasing power is highest in Germany. Retrieved September 20, 2008. ↑ Mercer, Highlights from the 2007 Quality of Living Survey. Retrieved September 20, 2008. ↑ Mercer, Moscow tops Mercer's cost of living list; London is close behind. Retrieved September 20, 2008. Jerram, Leif. 2007. Germany's Other Modernity: Munich and the Building of Metropolis, 1895-1930. Manchester: Manchester University Press. ISBN 9780719076077. Rosenfeld, Gavriel David. 2000. Munich and Memory: Architecture, Monuments, and the Legacy of the Third Reich. Berkeley: University of California Press. ISBN 9780520219106. World Fact Book. 2008. Germany. Retrieved September 1, 2008. This page was last modified on 30 October 2018, at 16:50.